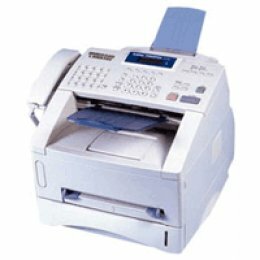 This network-ready, business class Laser Fax with Super G3 33.6K bps modem and 8MB memory with dual access can store up to 600 pages* for out-of-paper reception, QuickScan, auto dialing, and fax broadcasting to up to 282 locations. A paper capacity of up to 500 pages (dual 250-sheet trays), 50-page auto document feeder, and up to 4-day memory back-up combined with a high duty cycle and high yield consumables to handle demanding business applications cost-efficiently. 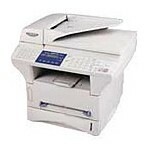 A built-in 10/100 BaseTX Ethernet network print/fax server allows for network connectivity now or in the future. Delivering high speed laser performance and reliability at low operating costs, it also copies at up to 15 copies/minute, sorts, enlarges and reduces.